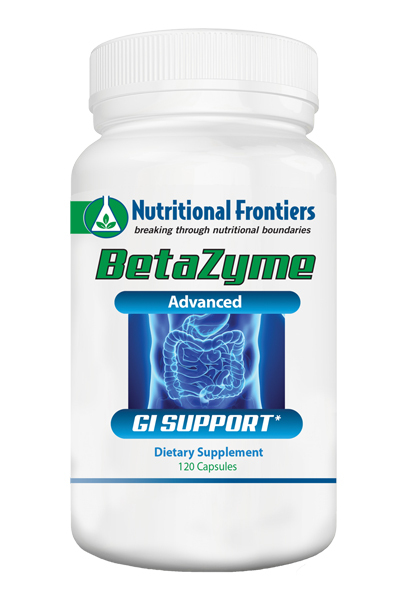 BetaZyme is an advanced synergistic enzyme formula with a unique blend of betaine HCL, pancreatin, gentian root, plus pepsin to support digestive tract function and nutrient absorption. Many individuals assume that heartburn, indigestion, gas, and reflux are caused by overproduction of stomach acid. This common misconception has been strongly reinforced by our conventional medical profession, whose practitioners routinely prescribe stomach acid blocking medications at the slightest sign of stomach dysfunction, often neglecting to provide patients with dietary recommendations. 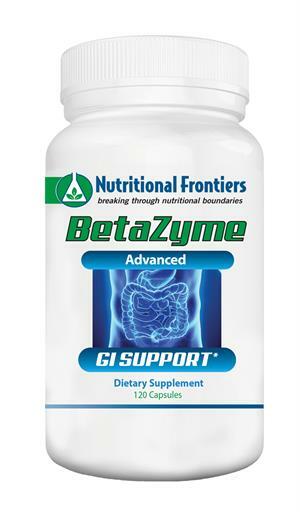 • Betaine HCL provides a source of hydrochloric acid, which is not considered a digestive enzyme but is necessary for the proper functioning of enzymes. Due to the overutilization of antacids, medications, lack of fiber, too much sugar, alcohol, fast foods and processed foods, many people are suffering from symptoms of low stomach acid. These symptoms may include bloating, gas, pain, yeast infections, skin conditions including acne rosacea, constipation, and diarrhea. • Pancreatin is a combination of the digestive enzymes including lipase, amylase and protease. These enzymes are normally produced by the pancreas and are important in the digestion of fats, starches and proteins. Pancreatin is used to replace digestive enzymes which the pancreas does not produce on its own. Certain medical conditions and medications contribute to the lack of enzyme production including pancreatic surgery, inflammation of the pancreas, pancreatic cancer, and cystic fibrosis. • Gentian Root extract has the ability to stimulate the appetite, stimulate the secretion of saliva and gastric juices, and accelerate the emptying of the stomach. Gentian was very effective in relieving the symptoms of indigestion and heartburn in human subjects. Gentian root has also been shown to reflexively stimulate the gallbladder and pancreas, and mucous membranes of the stomach, thus contributing to an increased secretion of digestive juices and enzymes. • Pepsin are needed in order to break down proteins into polypeptides. Those who take over-the-counter or prescription antacids actually may be doing more harm than good in that they may be hindering part of the digestive process. Additionally, it is thought that some food allergies, especially dairy and wheat are related to partially digested proteins passing through the intestinal wall. Since antacids decrease the effectiveness of pepsin, thereby increasing the number of partially digested proteins that can pass through to the intestine, it may be that antacids actually may increase the risk of food allergy development. Suggested Use: As a dietary supplement, take 1 capsule 1-2 times daily before or after a meal, or as directed by your healthcare practitioner. Do not chew. Not recommended for use if a peptic ulcer or gastritis is present.